A Canadian court has upheld the bulk of a decision that ordered three tobacco companies to pay billions in damages. The judgment involves class action suits that were consolidated against Imperial Tobacco Canada, Rothmans Benson & Hedges and JTI-MacDonald. The companies had appealed a 2015 ruling in favour that ordered them to pay over C$15bn (£8.5bn; $11bn). The plaintiffs were Quebec smokers who said the firms failed to warn them of health risks associated with smoking. 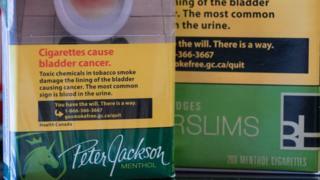 Rothmans, Benson & Hedges said on Friday it will seek leave to appeal to the Supreme Court of Canada. JTI-Macdonald Corp said it "fundamentally disagrees" with the decision and is considering all options, including an appeal. Plaintiffs said the firms knew since the 1950s that their product was causing cancer and other illnesses and failed to warn consumers. The companies had argued that Canadians have had a "high awareness" of smoking health risks for over half a century and say they have been strictly regulated. The Quebec Court of Appeal sided on Friday with a lower court decision that concluded the companies had failed to provide adequate information about the "safety defect" in their tobacco products. This is the largest award for damages in the country's history and will include interest on those damages. The two class-action lawsuits were originally filed in 1998 before they were consolidated. More teens are vaping - why? Smoking rates have reduced steadily in Canada over the years and in 2017 just under 17% of Canadians smoked at least occasionally. In recent years, US courts have ordered tobacco companies to pay large awards. But those payouts are often reduced upon appeal. A $28 bn (£18.3 bn) ruling against Philip Morris was reduced to $28m on appeal in 2011. American tobacco firms agreed in 1998 to pay US states over $200 bn (£131 bn) in fines in what is the largest civil litigation suit in US history. US states have been criticised for not spending enough of the compensation on anti-smoking programmes.